EISA held a regional policy dialogue on Tuesday 14 July 2009 in Johannesburg to share and deliberate on the findings of an empirical study on selected democracy protection institutions in southern Africa. The study was undertaken between March and May 2009. The main purpose of the study was to assess the capacity, regulatory framework and performance of Offices of the Ombudsman and Human Rights Commissions (or their equivalents) in selected SADC member states. Institutions in Botswana, Lesotho, Malawi, Mauritius, Namibia, South Africa, Tanzania and Zambia formed part of this pioneering research endeavour. It was conducted by researchers, based in these countries, who possessed the requisite knowledge of how these institutions operate, including the socio cultural and the politico economic environment within which they discharge their constitutional mandates. Office of the Ombudsman in Botswana, Dorothy Mpabanga 2009, EISA Research Report No 44. The Office of the Ombudsman in Lesotho, Motlamelle Anthony Kapa 2009, EISA Research Report No 39. 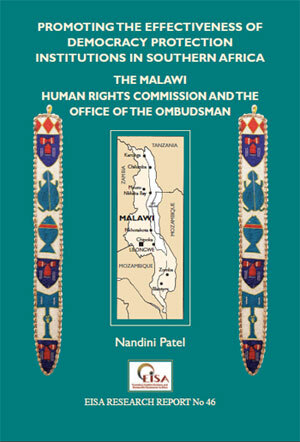 The Malawi Human Rights Commission and the Office of the Ombudsman, Nandini Patel 2009, EISA Research Report No 46. The Ombudsman and the National Human Rights Commission of Mauritius, LA Darga 2009, EISA Research Report No 45. The Case of the Office of the Ombudsman in Namibia, Lesley Blaauw 2009, EISA Research Report No 42. South Africa's Public Protector and Human Rights Commission, Catherine Musuva 2009, EISA Research Report No 41. Tanzania's Commission for Human Rights and Good Governance, Ernest T Mallya 2009, EISA Research Report No 40. The Commission for Investigations and the Permanent Human Rights Commission in Zambia, Annie Chewe-Chanda 2009, EISA Research report No 43. Regional policy dialogue brought together senior officials and heads of the institutions that formed part of this study as well as the in country researchers. Prof Kader Asmal will delivered the key note address.